Hugo me dijo que Chile dijera, “Por favor Lisa, no se vaya”. 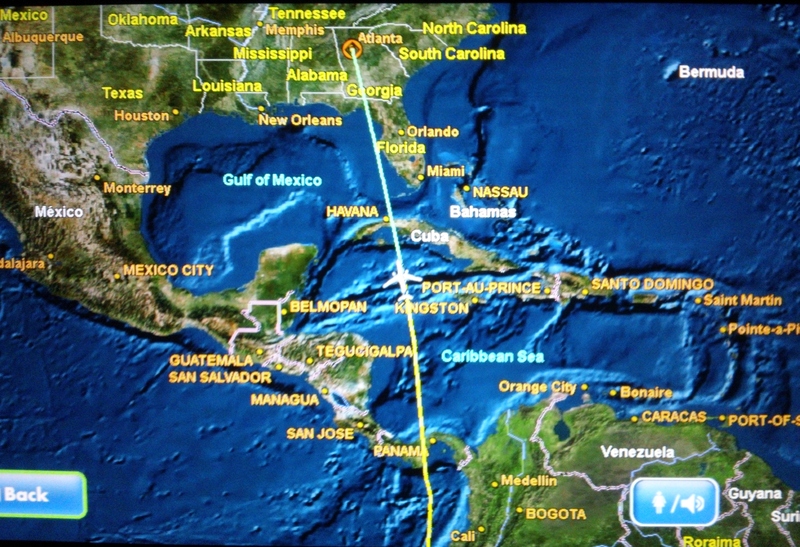 This is the story of how Camila and I were able to circumnavigate a potential international fumble, within an 6 hr. Chilean business day. 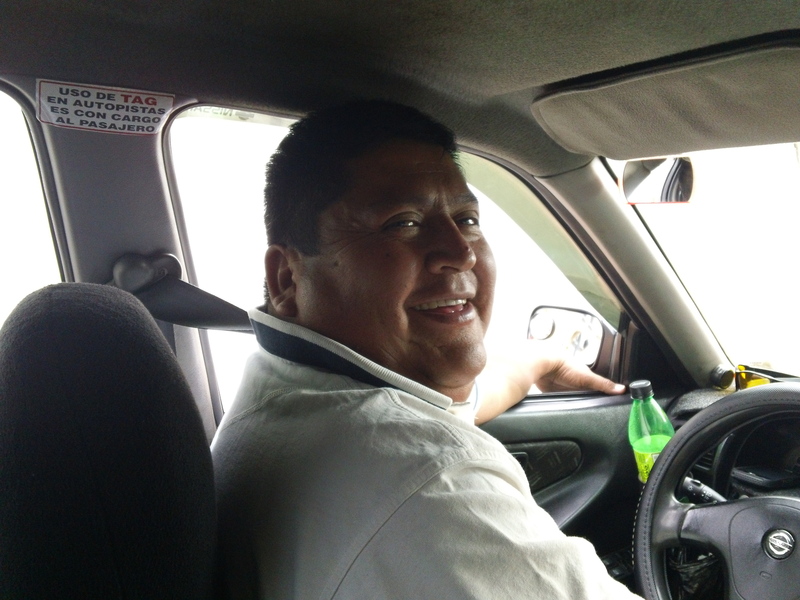 The story title comes from my good friend Hugo, a Santiago taxi cab driver I met about 2 months ago in Santiago. Hugo is also a Christian and was on “Team Lisa” along with Camila during my last day in Chile. He acted as our own personal private chauffer, getting us everywhere we needed to go that day. 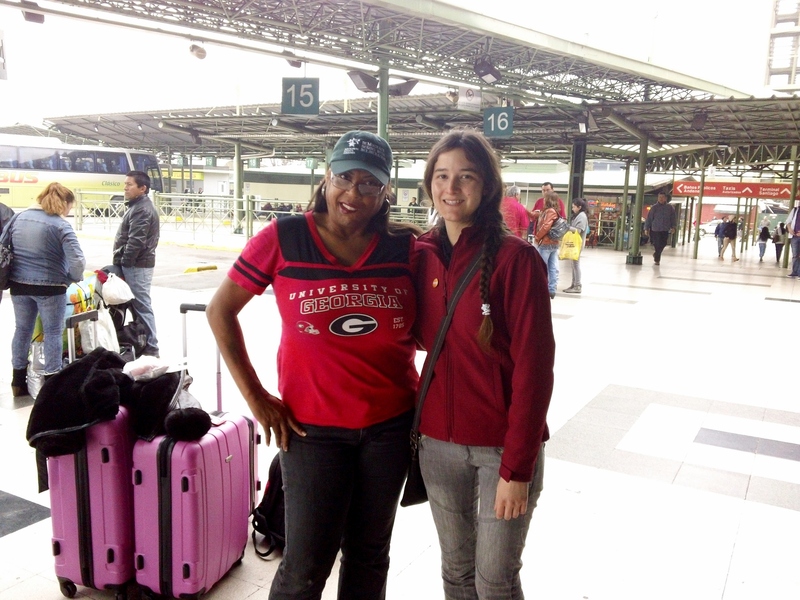 Camila and I are posed here before our incredible adventures in Santiago on Wednesday. 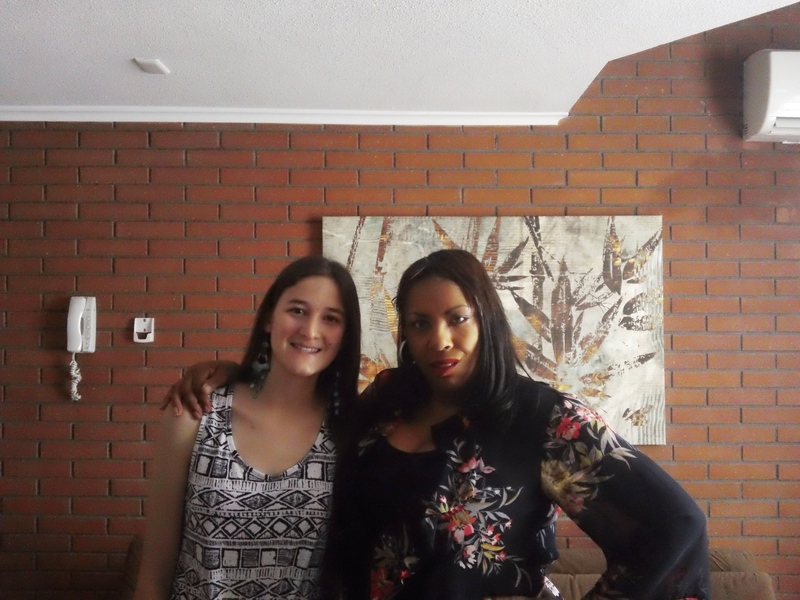 She is the very first friend that I made when arriving in Santiago, Chile at the Comodoro Arturo Merino Benítez International Airport and has now become an eternal extended-family member to me in Chile. More pictures and an updated story to come soon. Please stay tuned! It’s Saturday the 15th of December and I’m finally getting around to writing this blog post of high adventure. 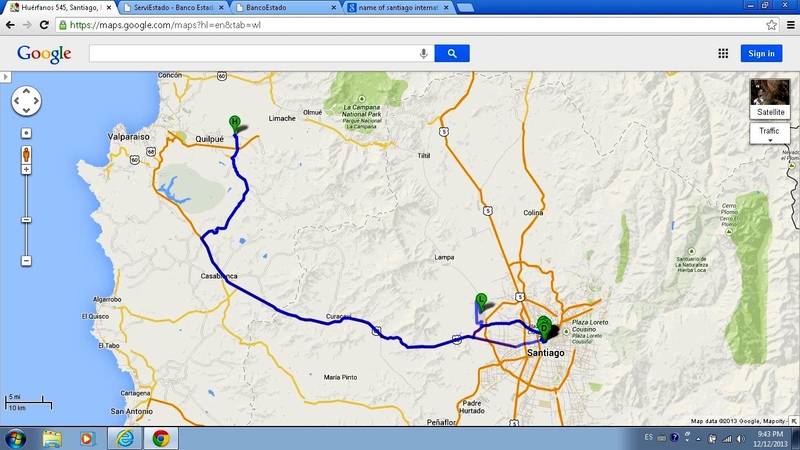 So it begins on Saturday, December 7th when I wake-up excited about my upcoming bus ride to Santiago. This was the date of my return flight back to the US and marked the end of my first international travel and Visiting Scholar experiences. All my arrangements where ready and ticket and my year-long student Visa was safe and secure in my travel bag. 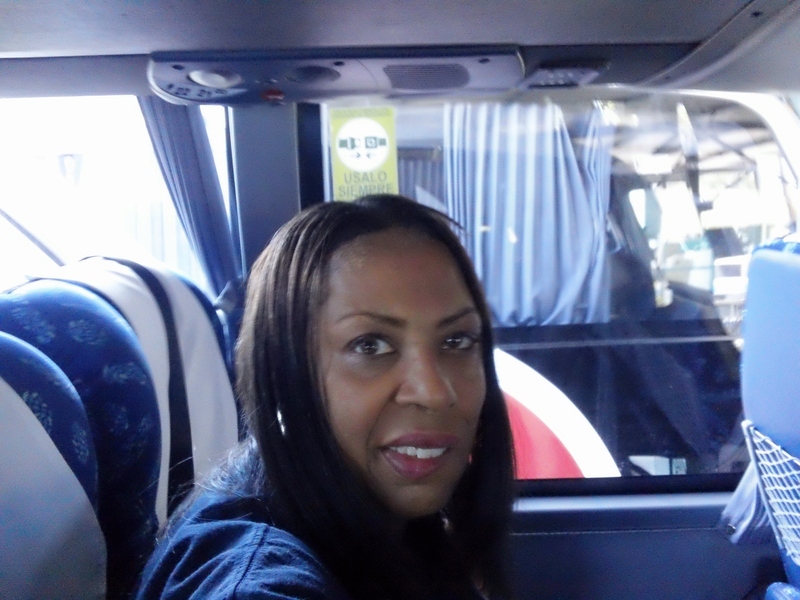 I was excited about my awesome seat on the brand new double decker TurBus to Santiago. Until, a family arrived to politely inform me I was sitting in the wrong set. 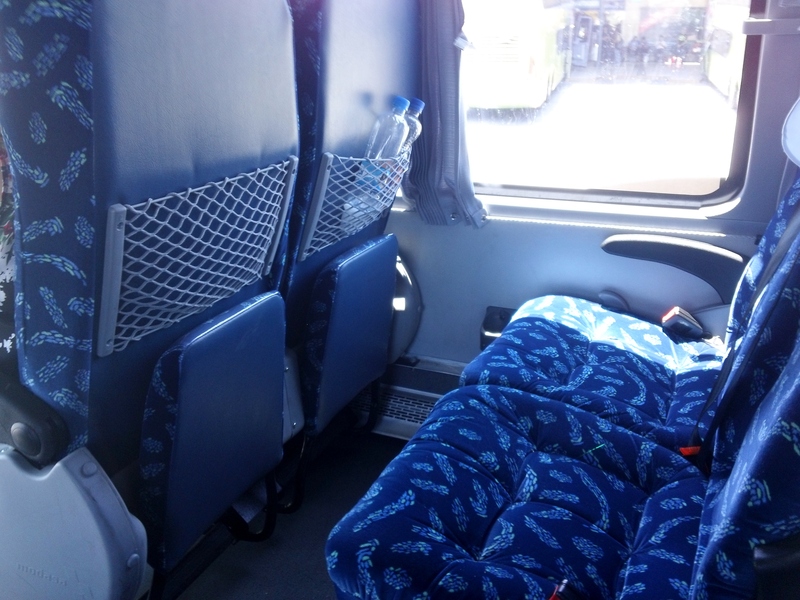 Oh well, I still had an awesome window seat that was clean and comfy for the 3 hour ride. 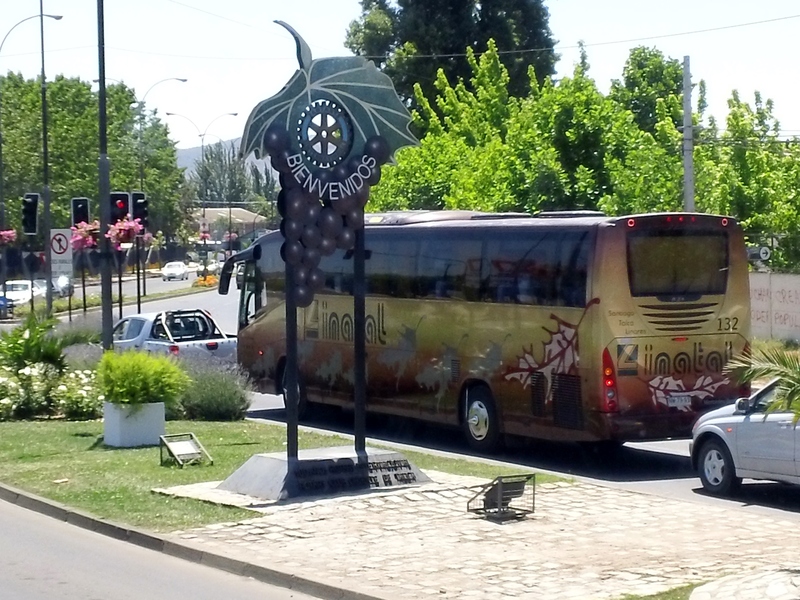 Above is the Welcome sign that you see as you enter Talca and I thought it a good opportunity to take a picture of this symbolic representation of the grapes that produce one of Chile’s most prized exports, its Vinos (wines). 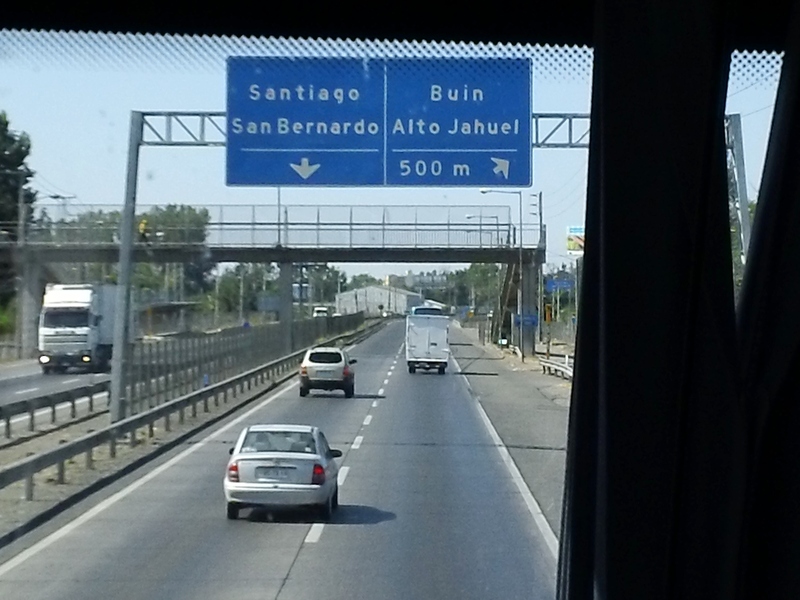 Little did I know of the irony of the Welcome to Talca sign until later that evening at the airport in Santiago. I was taken into a room which I later learned was the offices of the International Airport Police. As we were walking towards the office I began to panic because I had no idea why I was taken out of line and concerned I would somehow miss my flight needed to get this taken care of. 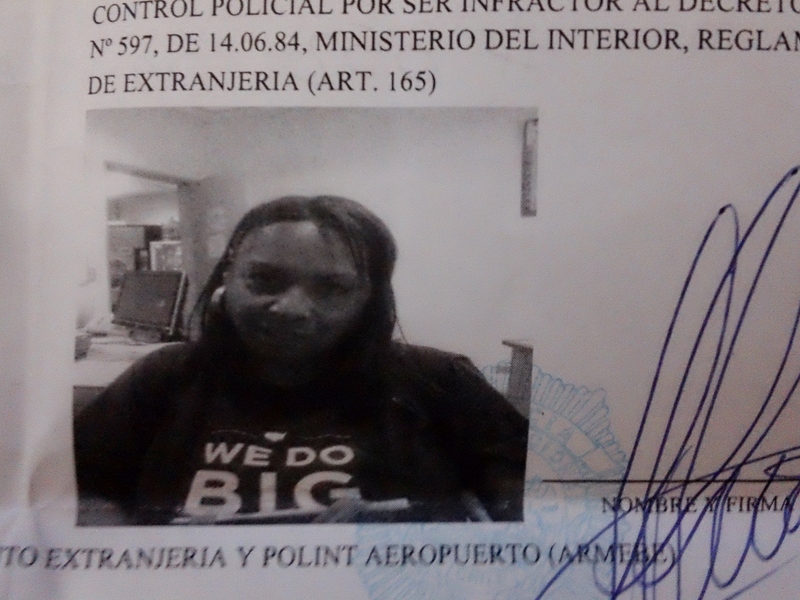 I called my Chilean hosts and had them speak to the officers as we walked since their Spanish was better than mine and they certainly would know better why I needed this ID. Unfortunately, they too were thinking it was a RUT number and encouraged me to relax and that everything would be fine. I must say, the officers were very nice and as I calmed myself was able to get a better idea of what was going on. I was being given a citation or and would have to appear in the office of the office of the Ministerio del Interior y Seguridad Púlica on WEDNESDAY MORNING BETWEEN 09:00 y 14:00. I took a deep breath and held back the tears as the officer tried to encourage me that everything should be fine. He gave me specific instructions to help expedite my process but my master’s degree is in Public Administration and never is dealing with a government bureaucracy an simple and easy process. I return to the Delta Airlines desk and ask that they retrieve my bag and reschedule my flight. The first attendant told me that there was a $300.00 USD change fee penalty and gave me the name of some guy named Carlos that I could call tomorrow to try and get the fee waived. I could no longer hold back the tears and headed to a Chilean “sistah” to ask for help on the matter. Or maybe she was Columbian but she looked like me and directed me to another Delta airline supervisor named Lukas. I explained my situation to him and he kindly dismissed my change fee but seemed a little hesitant to reschedule me for that following Wednesday evening (as he likely knew what I would be facing that day). Nevertheless, I felt the Lord leading me to secure the ticket and I scheduled my flight for Wednesday by faith believing God would grant me favor in resolving the matter. After talking to my Chilean host I immediately called my daughter (the Attorney) and she was not happy. Nevertheless, she when into lawyer mode and told me first things first, get your bag, your plane ticket rescheduled, and return to Talca so we can Skype. I was an emotional mess but she helped me get it together. 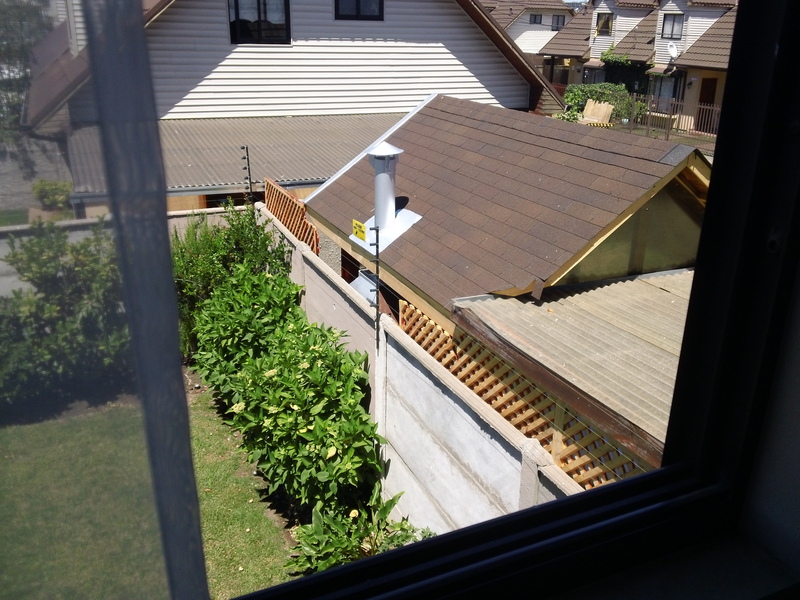 When I got back to Talca about 2am I checked in with my daughter and we arranged to talk in the morning. 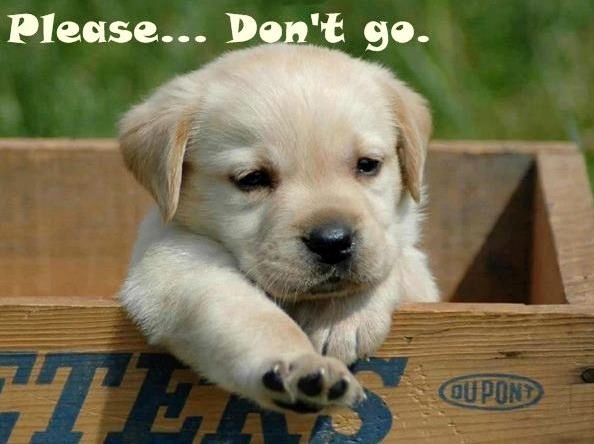 If you have been following my blog you know that my laptop died 2 weeks ago and I had been using a loaner laptop from my office which I returned to them when I departed on Friday. Carmen (my hostess) allowed me to use her laptop to Skype with my daughter. As I read the ticket it seemed more serious than a slap on the wrist. I type out the citación in Spanish for my daughter and she when to work researching the issue. 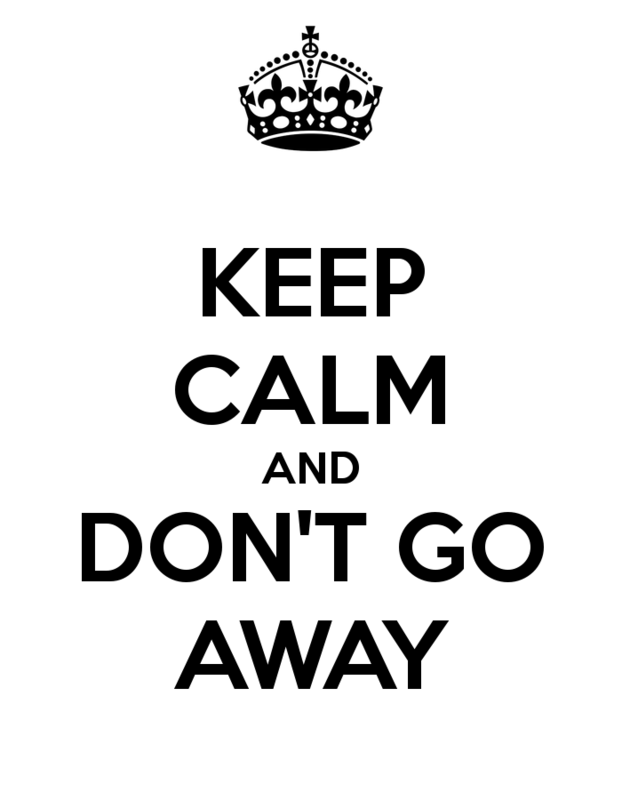 She called me back and told me ¨Mom, I don´t want you to get upset but this is serious.¨ She then directed me to find a native speaker who could go with me to my appointment on Wednesday as she felt I would need the support of a native speaker and getting an attorney would delay my return even further. That´s when I contacted my Chilean daughter Camila. She immediately agreed to go with me and coordinated communications with my daughter as my attorney and interpreter developed the strategy of Mission get Mom on the Plane Wednesday. 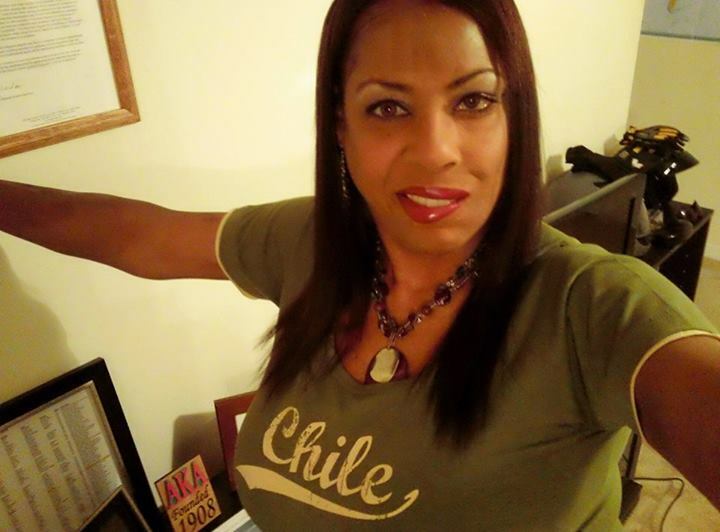 I return to campus early Monday, morning in an effort to connect with Jeanette Fuentes who coordinates International Student Affairs for our campus at Universidad Católica del Maule. Again, God showed up right when I needed assistance as she was walking down the corridor to her office right as I was leaving mine to head her way. I had assumed she read my email the night before but, she had not had the chance to do so. We immediately contacted my Office of International Education back at the University of Georgia and they were not aware of the Nº 597, DE 14.06.84 (ART .165) law either. 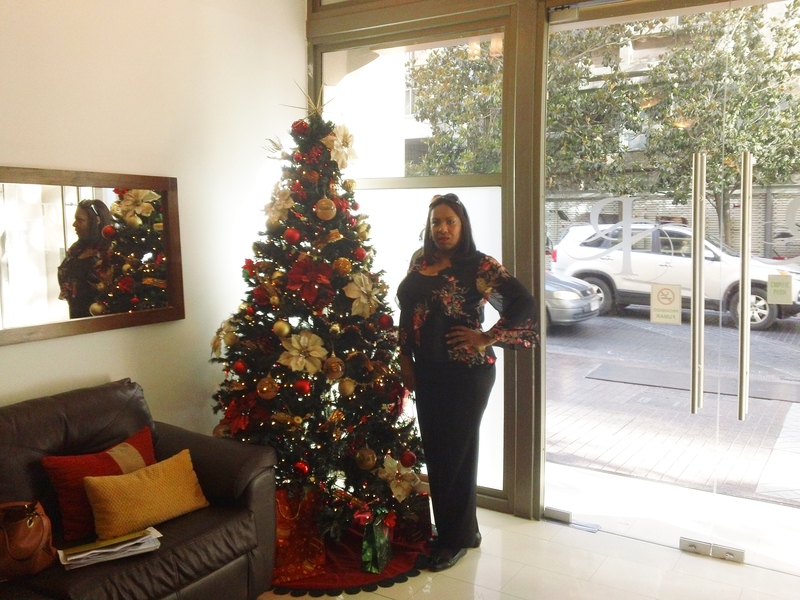 Jeanette contacted the Talca International Affairs office and Officer Mauricio Urbina explained everything to all of us. There is a law for anyone in Chile for more than 6 months to register with the local comuna within 30 days of arrival to the country. Failure to do so can lead to your deportation. 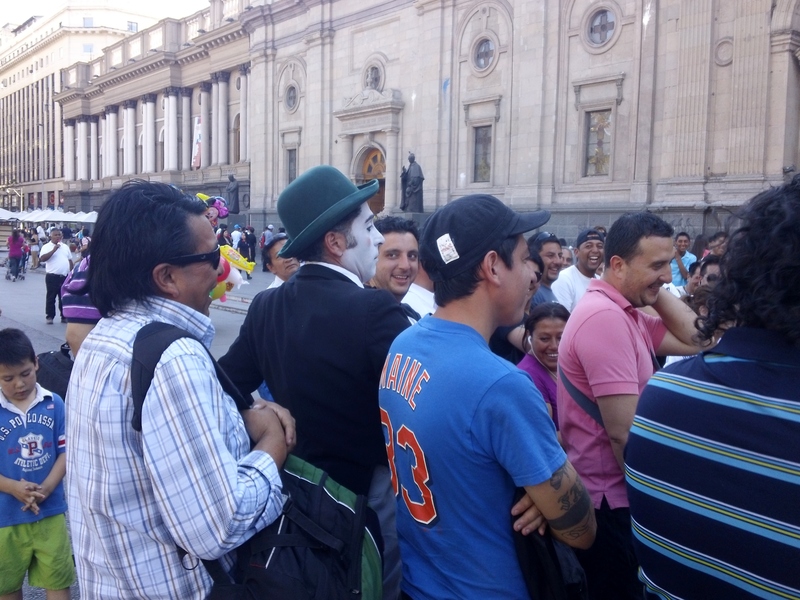 He felt that I should be able to resolve the matter in Santiago but would likely have to pay a fine of anywhere between 30,000 to 50,000 pesos or ($60 to $100 USD), but I would not have a negative mark on my Visa. I was relieved about that news. 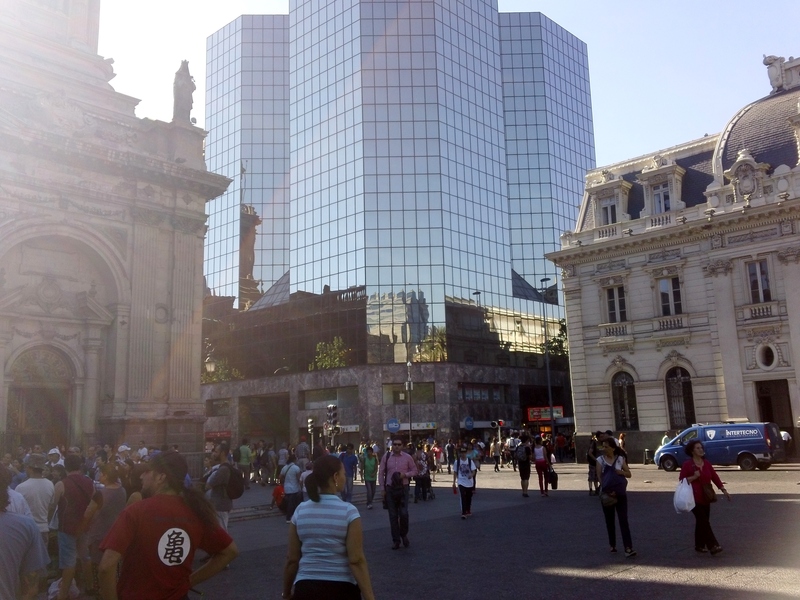 Everyone was happy to learn that I would have a native Chilean interpreter with me during my appointments so I set out on Tuesday afternoon and secured a hotel stay in Santiago so I could be in the Minister´s office bright and early. 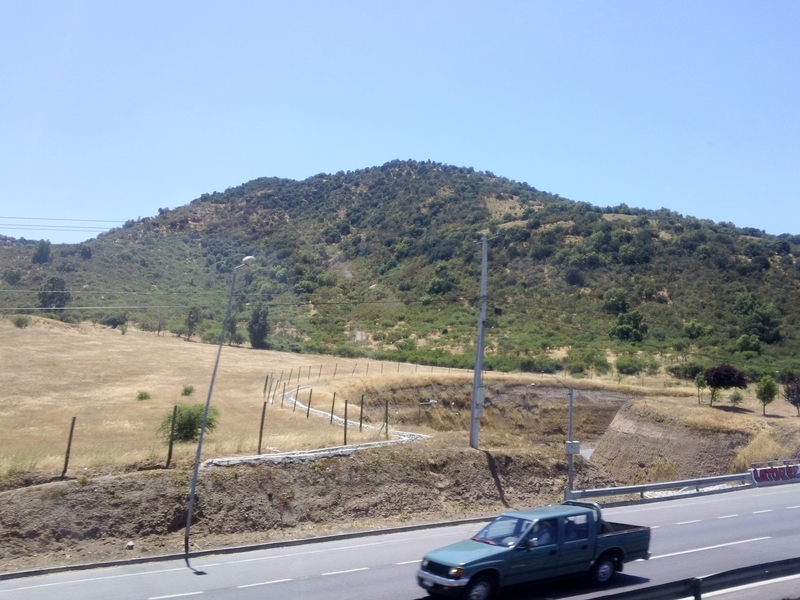 So I say all of my goodbyes to my friends in Talca, everyone from my housemates to officemates gave me 100% support and encouragement, and headed back to Santiago. Our bus made a brief stop to pick up passengers from a small town on the way to Santiago and a farmers and vendors would board the buses selling things to eat. 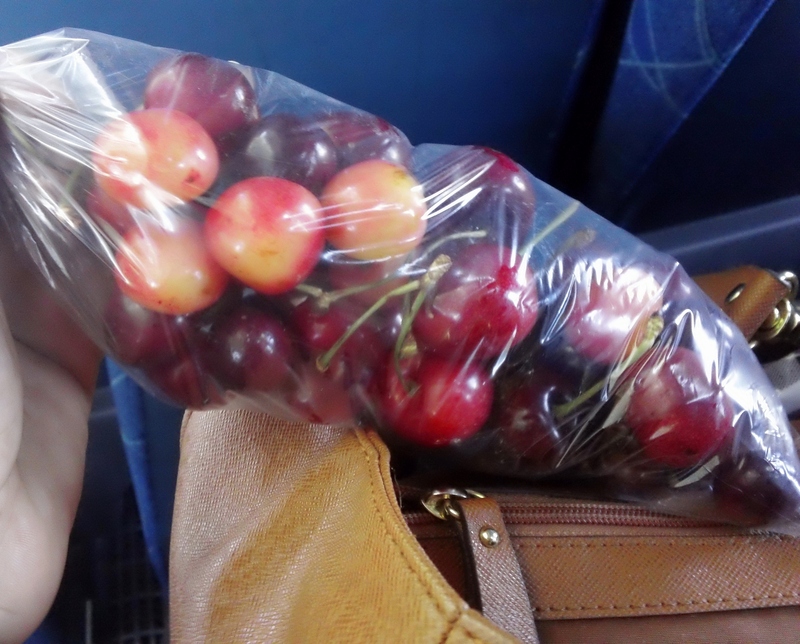 I got this bag of the best cherries for $2 bucks. 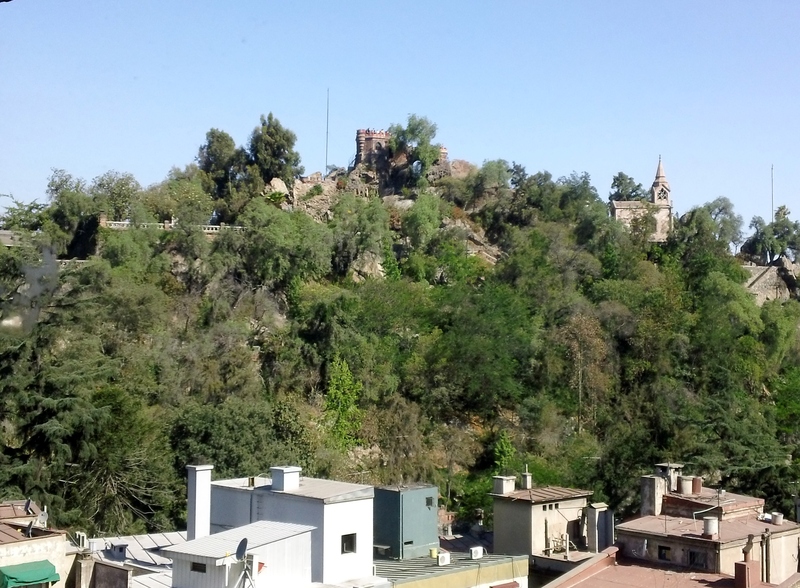 So I´m feeling positive and enjoyed my 3 hour return to Santiago. 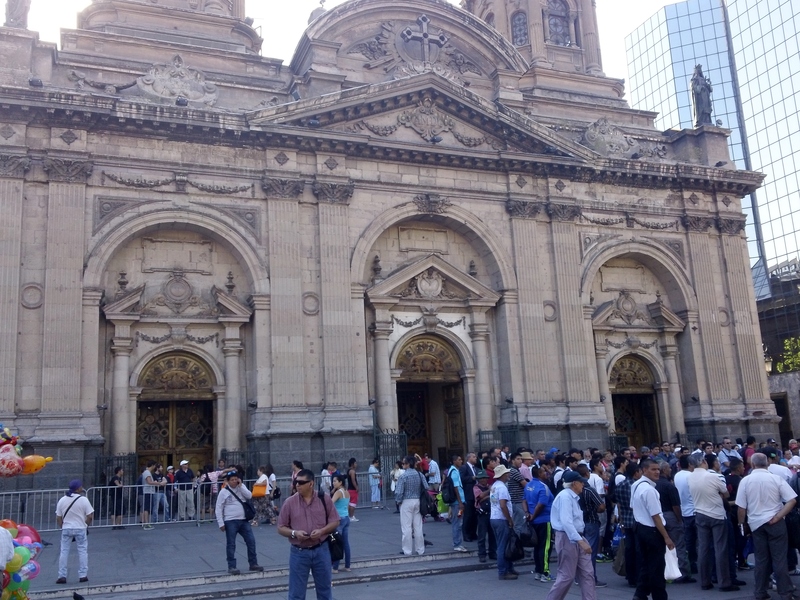 I decided to make the best of my day in Santiago and toured the city. 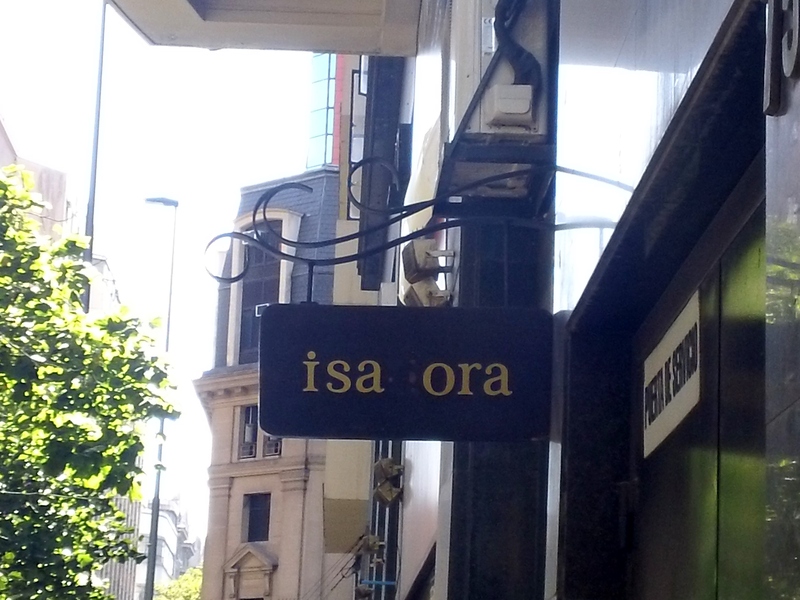 I sensed the Spirit of the Lord telling me to look up and I saw this sign outside of a store shop (below ) were a letter had fallen off and it looked almost like my name ¨Lisa¨ and the word ora in Spanish means he/she prays. So, Lisa prays… now, only the Holy Spirit would draw a person´s attention to something like this. Any believers reading this post know what I am talking about. God will use people, places, and things to let you know he is with you and loves you as he did for me during this experience. I am a living witness to God´s favor in my life on a regular basis. 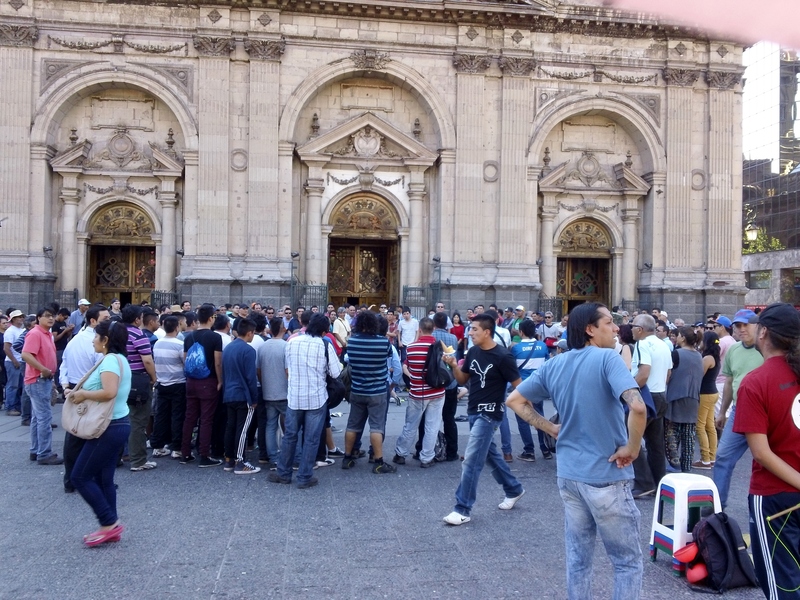 So here are my pictures from the Plaza de Armas and there happened to be some street performers there that afternoon. I had no ideal what the guy doing tricks with money was exactly performing but, everyone seemed to be enjoying it. 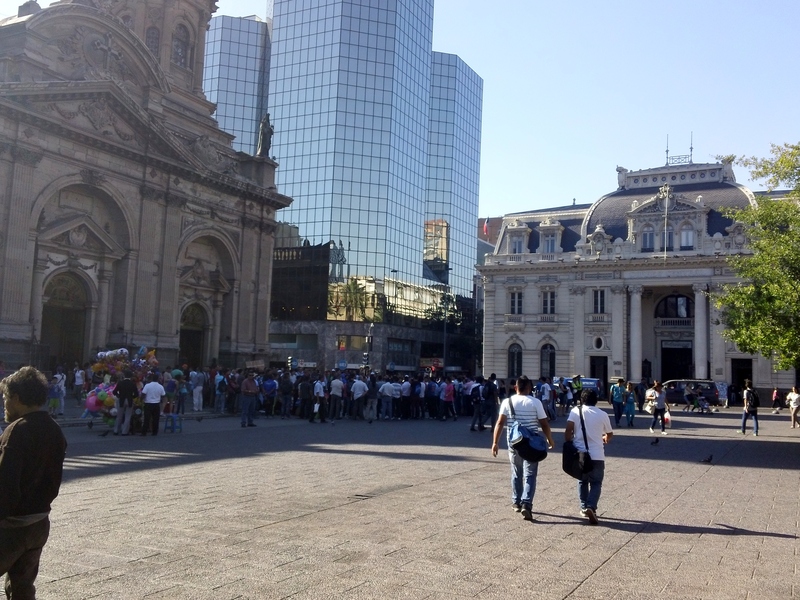 I stopped to ask a nearby couple in Spanish was that location the Plaza de Armas and what was happening. 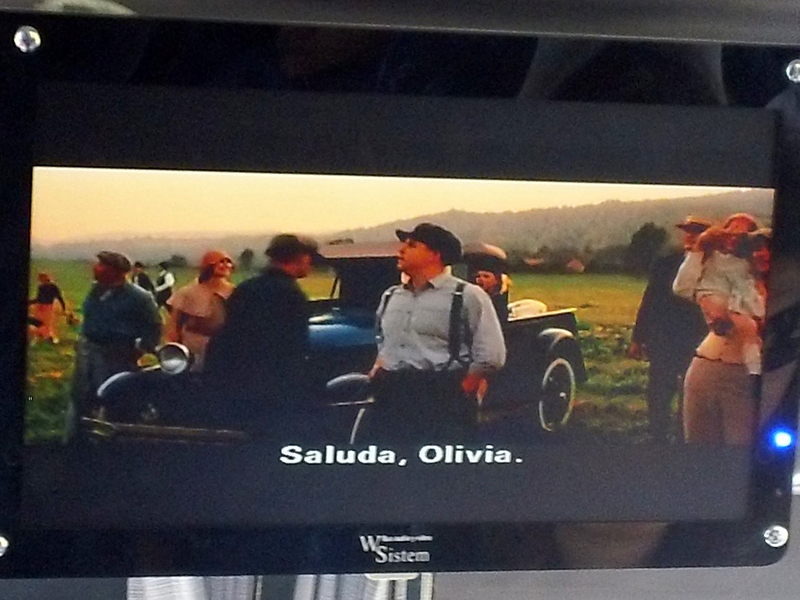 He politely turned to me and said “No comprendo español¨. I giggled and replied, ¨Oh, you speak English, where are you from?¨ He politely replied Australia and I told him I was North American and continued on my journey. So funny!! 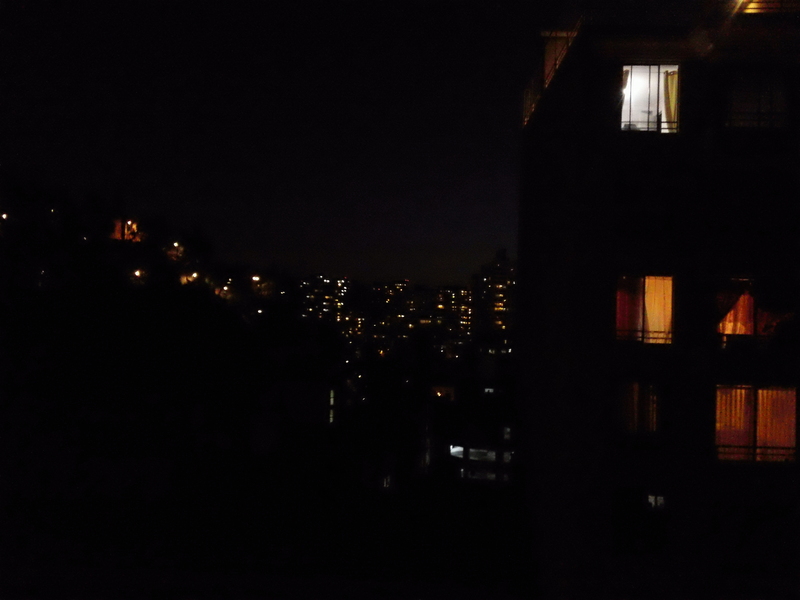 The above is a lovely nighttime view of downtown Santiago form my apartemento balcony. I´m up bright and early 6:30 am Wednesday morning dressed to impress and awaited Hugo (my cabby) and Camila’s arrival to start our mission. Both arrive on time and we are off to the races. The above two Google maps represents our game plan in getting from all our stops in downtown Santiago (that includes getting my passport and paying the fine) to the final arrival goal of the international airport to catch my flight home Wednesday night. We are at the office 30 minutes before it opened and hundreds of people were already there standing in line. We walked in, took a number and a man came to use and ushered us to the front of a line where only 2 other people were ahead of us. We got to the cashier’s window all excited thinking this is going to be a piece of cake!! We pay the fine pick up my passport and we are DONE BABY!! We get to the attendant (sidebar: No one beside Camila could speak English during my many stops that day so not having her with me per Bridjette’s directives would have been a disaster) and he tells us that my infraction was not entered into the system and there was no way for me to pay the fine. When asked when my information would be there he said in up to 15 days, a week if I was lucky. 16. Tempted to kiss the ground outside when I get to my Groome shuttle to Athens. Everyone was so helpful and sympathetic to my issue. 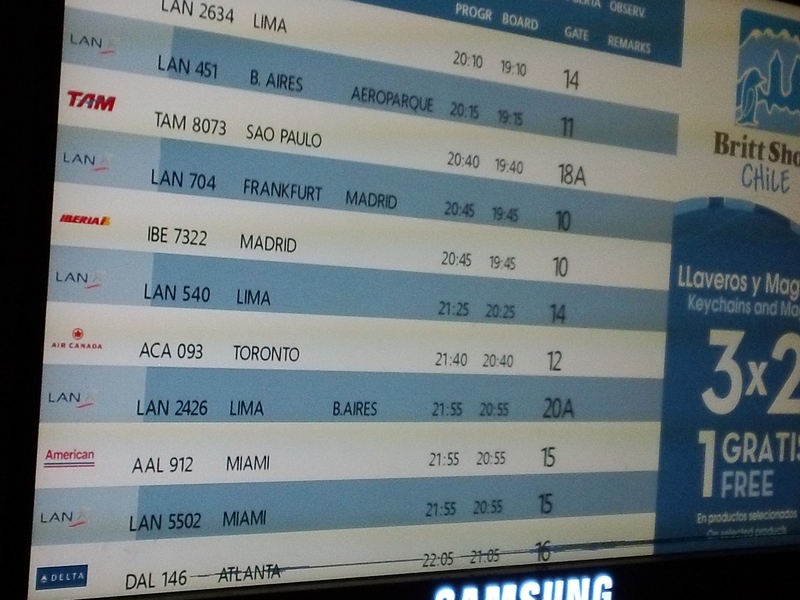 They all knew I had a 10:10pm flight schedule to the US and worked diligently to resolve all of my problems. 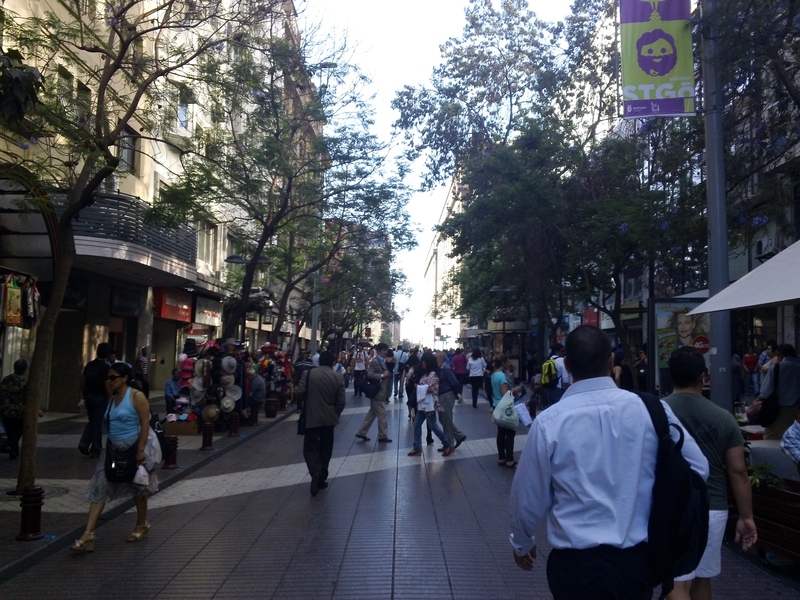 That is why I love Chile and will be coming back for more next semester 2014. Hello home country USA, I missed yah! I thought this was an awesome view of the 3 Americas (i.e., North, Central, and South) from the planes inflight travel map. 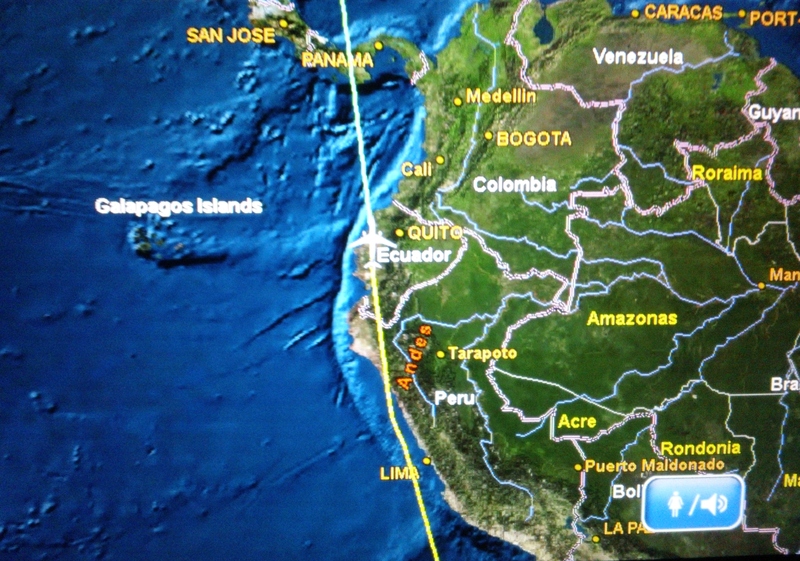 Check out the image of my little airplane right in the middle of all three countries. Now that’s simply poetically maravilloso!! Here’s my I’m so happy to be back at my condo pic only to find out upon my arrival that the neighbor’s place above me leaked water on my walls causing mold in two rooms, and that my car didn’t start (it’s in the shop until Monday). But you know what? I feel very blessed and highly favored. I wouldn’t have changed a thing. Oh wait, yes I would… I most certainly would have registered in the International Affairs Office in Talca had I known to do so. Won’t make that mistake again!! Well, I hope you’ve enjoyed The Chilean Chronicles this semester and I’ll Blog to you later. Yuk yuk! This entry was posted in Adult Education, Blog Archives, Doctoral Research, People and Culture, Visiting Scholar and tagged Blessings, Chile, Christianity, Dissertation Research, Faith, God's Favor, International Travel Law, Santiago, Study Abroad, Talca, UGA Doctoral Candidate Abroad, United States, Universidad Católica del Maule, University of Georgia, Visa, Visiting Scholar. Bookmark the permalink. Greatly enjoyed your blog! So glad you made it back in good spirits! You have officially had your first real trámites nightmare! Congratulations! I’ve had to learn the hard way again and again that paperwork and trámites are never what they seem in Chile… But you really stepped up and handled it well. And it’s wonderful that you had so many people on “Team Rescue Lisa!” Hahaha 😀 All you can do is keep your sense of humor and move forward the best you can. Espero que hayas tenido una navidad estupenda junto a tu hija, familia, y amigos, y también que descanses harto en preparación para las aventuras del semestre que viene… tengo muchas ganas de leer más de tus cuentos! Ha ha!! Honestly Gab, reading your blog about the “trámites” (along with my daughter’s advise) gave me the wisdom to ask Camila to come with me. I am too looking forward to next semester’s adventures and will be following your blog for more insight and to keep myself out of trouble. Hope this Christmas and New Year season rains blessings and only good things for you and your family.